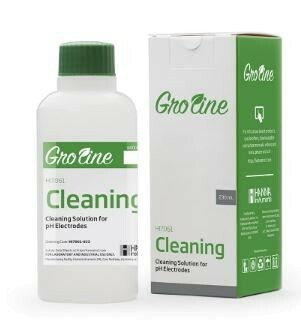 Product information "HI7061-023 GroLine General Purpose Cleaning Solution (230 mL)"
HI7061-023 is the GroLine general purpose cleaning solution that can be used for a variety of applications. Electrodes can become dirty from use and will produce inaccurate results even as they read correctly in a pH buffer. Hanna’s cleaning solutions eliminate impurities and residues that are left on electrode surfaces when immersed in samples during measurement or when stored incorrectly. Hanna suggests cleaning the bulb and junction of your electrode on a regular basis to ensure that the probe is always clean and to prevent any clogging of the junction. Cleaning is a fast and effective routine that should be performed on a regular basis as a preventative measure against using a dirty electrode and to ensure that the junction is not clogged. By simply immersing the electrode in the HI7061-023 cleaning solution for 15 to 20 minutes will dissolve any mineral deposits or other coatings. Related links to "HI7061-023 GroLine General Purpose Cleaning Solution (230 mL)"
Customer evaluation for "HI7061-023 GroLine General Purpose Cleaning Solution (230 mL)"